If you have ever watched this popular television show where two families compete to answer a series of questions in order to try and win a jackpot prize and spent the time shouting at the TV when they give a stupid answer, this is your chance to have your moment. 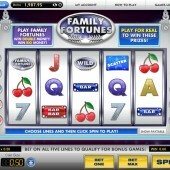 Family Fortunes is a classic television show and thanks to online slot developer Gamesys it has now been transferred into a 5-reel, 5-payline online slot where you now have the chance to win the Big Money. Now, it might be hard to wonder how they could take the funny format of the television gameshow and transfer it into an online slot game but Gamesys have done a decent job at making this conversion. Fans of the show will perhaps be slightly disappointed that the game is not totally influenced by the television show. However, this is definitely a worthy translation of the game show. Symbols on the reels consist of classic slot symbols such as a single bar, double bar and a cherry. There is also an abundance of features to trigger during the game. 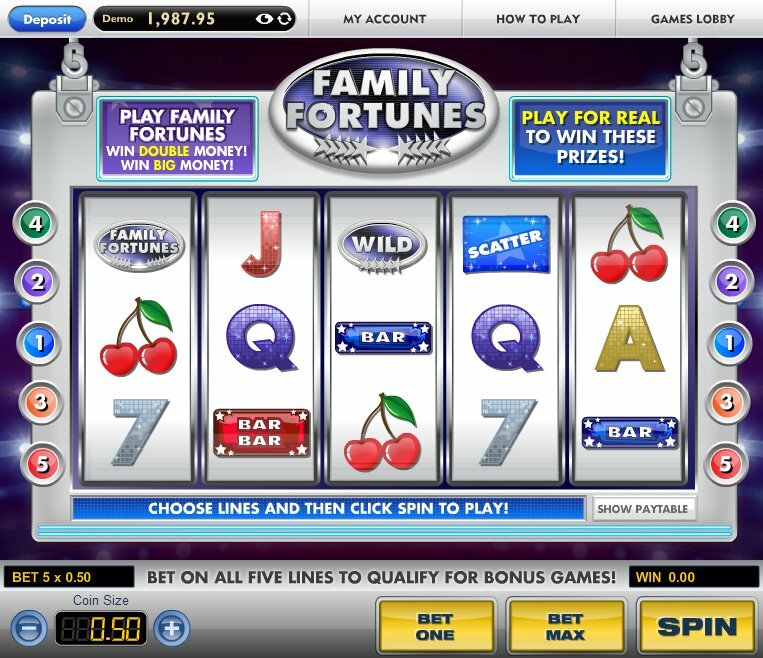 The Family Fortunes Wild symbol substitutes for all other symbols except for the Family Fortunes Logo and Free Spin Envelope scatter symbols to complete winning combinations and multiple Wild symbols on an active pay-line do create winning combinations. The two scatter symbols both have key roles to play in this slot. If you hit three or more of the Free Spin Envelope scatter symbols across the reels then you will trigger the free spins bonus round. You can be awarded up to 25 free spins when you trigger this bonus feature so it is well worth keeping an eye out for the Free Spin Envelope scatter symbols. It is possible to re-trigger the free spins if you hit three or more of the Free Spin Envelope scatter symbols across the reels. The second scatter symbol in the form of the Family Fortunes Logo is also the secret to triggering one of the most exhilarating bonus features around. In order to trigger the Family Fortunes Bonus you must hit the Family Fortunes Logo scatter symbols on Reels 1, 3 and 5 at the same time. Once triggered, you will need to nominate a member of the five family members shown at the bottom of the screen. You will then be posed a question that has three possible answers to choose from. As in the television show, if you choose an answer that is not on the big screen you will receive a big ‘X’. Can You Win the Jackpot in the Star Prize Bonus Round? Once the questions have been completed, you will then be taken to the Star Prize Bonus Round. You are presented with a 3 x 5 grid of cubes and you must then choose a selection of cubes to reveal prizes. If you reveal three stars then you will be awarded the lucrative star prize. Family Fortunes is arguably the best Gamesys release out there. The game provides a great template for a slot game and Gamesys have done a great job translating it to the online platform. It has done the seemingly impossible task of overshadowing the popular game show slot Deal or No Deal and offers something different to the vintage IGT slots such as the Egyptian themed Cleopatra and the classic television game show 100,000 Pyramid.